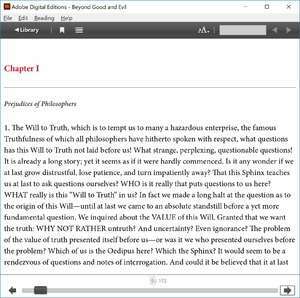 Adobe Digital Editions is an eBook reader which can both display various formats of ebook and help you manage them. The program is basically a freeware product produced by Adobe which is compatible with PDF and ePub eBook formats. With Adobe Digital Editions, you can have a collection of eBooks and store them in customizable virtual eBook shelves. When you open them, they can be viewed in full screen mode for distraction-free reading and pages can be bookmarked. Version 4.5.10.186048 is a freeware program which does not have restrictions and it's free so it doesn't cost anything. For security reasons, you should also check out the Adobe Digital Editions download at LO4D.com which includes virus and malware tests. Additional screenshots of this application download may be available, too.